While travelling on the Walker Creek Forest Service Road (FSR), attention is required to navigate the surface as it is uneven, rutted, slippery and very rough. The road is not recommended for anything other than a 4x4, high clearance vehicle, and drivers familiar with this type of vehicle operation. The trail between Bastille Creek and Buchanan Creek can result in quite a bit of hiking around sections where the old road surface has washed away and some travel on muddy sections of the winter snowmobile route due to ATV/UTV traffic and wet conditions up to Buchanan Creek where ATV/UTV traffic is not permitted within the boundaries of the Park. Trail/route surface is a good hard surface from Buchanan Creek to Kakwa Lake. Kakwa Provincial Park showcases ice-clad mountains, extensive alpine meadows and a section of the Continental Divide. 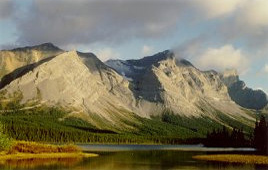 Main physical features include Mount Sir Alexander (3270 m), Mount Ida (3189 m) and Kakwa Lake. Summer activities include camping, hiking, fishing, and horseback trips. Winter activities include snowmobiling and wilderness ski tours. The wide range of species diversity gives excellent opportunity for wildlife viewing. Visitors interested in photography will appreciate the incredible beauty of the remote area. Winter visitors should note limited access routes apply. There are two areas at the south end of Kakwa Lake that have been designated for camping: one is for hiker traffic (West side of Wapumun Creek) and the other is for horse traffic (East side of Wapumum Creek). These sites each have a pit toilet and fire circle, horse users are requested to cross Wapumun Creek at one specially marked location only: at the blue bamboo poles near the north end of the creek where it flows into Kakwa Lake. The creek is a crucial spawning creek for the Rainbow trout that inhabit Kakwa Lake, and horses crossing along the creek would damage the spawning beds. Horse users please avoid this area with your horses as this area is a source of drinking water for park visitors. The park is a user maintained park, so pack out whatever you have packed into the park. Please cooperate and help to keep the park pristine for future visitors. During the summer of 2007 there were two new cabins constructed at the south end of Kakwa Lake (the old cabins have been removed); one is open for public use and the other is the park headquarters used by park rangers and volunteer park hosts. The public cabin is open on a first-come first-serve basis year-round and is open to all park users, this cabin is equipped with a woodstove, table and bench, accommodations for approximately 10 people with sleeping platforms and a loft, and a counter with storage underneath the counter top. Please note this cabin doubles as an emergency shelter and warming hut, so please keep it clean and in better shape than found. Please dump gray water into the pit toilet that is located near the cabin. Firearms are not permitted in the provincial park unless during an open season specified under the Wildlife Act and anyone hunting must have a valid licence and appropriate species licence. Walker Creek access road condition up to Bastille Creek (km 75) varies. Please read Attention Visitors notice above. From there it is 29 km to Kakwa Lake. The section between Bastille and Buchanan Creeks (10 km) is wet and muddy in spots, depending on the weather, and from Buchanan up to Kakwa lake (19 km) is dry and a pretty hard surface. Be prepared for any weather conditions while visiting the park, you are in an isolated area and weather can change rapidly. Carry extra fuel, as it is an approximately 100 km run to Kakwa Lake from where you off load. Please pack out whatever you have packed in. Bring your own drinking water, as potable water is not available at the park. The public cabin up at Kakwa Lake is first-come, first served, so be prepared to camp outside. If leaving your vehicle at the trail head, we suggest that you surround your vehicle with chicken wire. Porcupines may chew on brake and fuel lines. Public cabin at Kakwa Lake – please ensure you close and latch the door so that the porcupines cannot get in. Located approximately 70 km north of McBride in British Columbia. The Kakwa Provincial Park can be accessed from McBride in B.C., Grand Prairie in Alberta, or by air charter. The closest communities, towns and cities are McBride, Prince George and Valemount. Wildlife: Wildlife species found in Kakwa include grizzly and black bear, caribou, moose, deer, elk, wolves, Rocky Mountain bighorn sheep, mountain goat, wolverine and marten. There are climbing opportunities and visitors should be experienced. At present little is known about the fishery in Kakwa Lake. Anglers are asked to limit their catch in order to preserve angling opportunities in years to come. Kakwa and Cecilia Lake are closed to angling November 1 to April 30. Anyone fishing or angling in British Columbia must have an appropriate licence. A number of hiking routes exist within Kakwa Provincial Park, but these trails are unmarked and not maintained. For your own safety and the preservation of the park, obey posted signs and keep to designated trails. Shortcutting trails destroys plant life and soil structure. Horseback riding is permitted in Kakwa Provincial Park. There is an area at the south end of Kakwa Lake designated for horse traffic camping (East side of Wapumum Creek). The site has a pit toilet and fire circle, horse users are requested to cross Wapumun Creek at one specialy marked location only: at the blue bamboo poles near the north end of the creek where it flows into Kakwa Lake. The creek is a crucial spawning creek for the Rainbow trout that inhabit Kakwa Lake, and horses crossing along the creek would damage the spawning beds. Horse users please do not let horses swim in the lake in front of the cabin as this area is a source of drinking water for park visitors. The park is a user maintained park, so pack out whatever you have packed into the park. Please cooperate and keep the park pristine for future visitors. There is no viewing platform but there are amazing mountain views and wildlife habitats. Visitors should be prepared for any kind of mountain weather conditions. Visitors can backcountry ski and snowshoe along the trails in the park. Visitors should be trained in avalanche awareness. Kakwa winter use: Snowmobiling is a popular winter recreational use of the park from both B.C. and Alberta, mostly in the Kakwa and Cecilia Lakes areas. Popular snowmobiling areas are the watersheds of Babette, Cecilia and Kakwa Lakes, McGregor Pass, Mt. Ruth, Sheep Pass, Mt. Sir Alexander and there are many open ridges and meadows. Areas open to snowmobiling are zoned as Nature Recreation Zones and snowmobiling is permitted during snowmobiling season from Dec 1st to April 15/30th each winter. For information about where snowmobile is allowed in the park. View a snowmobiling zoning map [PDF 7.7MB]. Overnight snowmobile users are restricted to the cabin at Kakwa Lake and should be aware that cabins are being used by BC Parks staff regularly. Users must supply their own wood for fuel from outside of the park. Snowmobile tent camps are not permitted in Kakwa Provincial Park. There is no public access road into the park. In B.C., the Walker Creek Forest Road from Highway 16 currently provides access to the Bastille River at km 75, Bastille River is 10 km away from the park boundary. From Grand Prairie, the 112 km Kakwa River Forestry Road leads to the eastern boundary of Alberta's Kakwa Wildland Park. Both approaches require long trips with no facilities and are only recommended for the most experienced snowmobilers. The role of the Kakwa Management Plan is to ensure that legitimate wilderness recreational snowmobiling occurs. Avalanche training is strongly recommended for any winter recreational activities in the park. If you plan to snowmobile in Kakwa Provincial Park you need to be prepared with emergency equipment as it is an isolated area and distances are great. There is one public use cabin located at Kakwa Lake that will sleep approximately 10 people; the cabin is available on a first-come, first-served basis year-round, but if fully occupied, the public needs to be prepared to camp outside in a tent. Please keep the cabin clean and tidy. No firewood is available. Visitors can supply their own firewood. Campfires are allowed in designated campsites at the south end of Kakwa Lake only. It is not permitted to gather firewood from the area around your campsite or elsewhere in the park. Dead wood is an important element for many plants and animals and it adds organic matter to the soil. You can conserve firewood and air quality by keeping your campfire small. It is recommended to bring a portable stove for cooking. There are 12 walk-in, wilderness campsites, with pit toilets and fire circles provided. The walk-in/wilderness campsites are all on a first-come, first-serve basis; reservations are not accepted. During the winter season, campers may use the cabins but usage is on a first-come, first-served basis; be prepared for winter conditions and to camp outside. There are two areas at the south end of Kakwa Lake that have been designated for camping: one is for hiker traffic (West side of Wapumun Creek) and the other is for horse traffic (East side of Wapumum Creek). These sites each have a pit toilet and fire circle, horse users are requested to cross Wapumun Creek at one specially marked location only: at the blue bamboo poles near the north end of the creek where it flows into Kakwa Lake. The creek is a crucial spawning creek for the Rainbow trout that inhabit Kakwa Lake, and horses crossing along the creek would damage the spawning beds. Horse users please do not let horses swim in the lake in front of the cabin as this area is a source of drinking water for park visitors. The park is a user maintained park, so pack out whatever you have packed into the park. Please cooperate and keep the park pristine for future visitors.